OKLAHOMA CITY -- In their zeal to tout their faith in the public square, conservatives in Oklahoma may have unwittingly opened the door to a wide range of religious groups, including satanists who are seeking to put their own statue next to a Ten Commandments monument on the Statehouse steps. Rep. Mike Ritze, R-Broken Arrow, who spearheaded the push for the Ten Commandments monument and whose family helped pay the $10,000 for its construction, declined to comment on the Satanic Temple's effort, but Greaves credited Ritze for opening the door to the group's proposal. The Oklahoma Legislature has taken other steps that many believe blur the line that divides church and state. The House speaker said he wants to build a chapel inside the Capitol to celebrate Oklahoma's "Judeo-Christian heritage." Several lawmakers have said they want to allow nativity scenes and other religious-themed symbols in public schools. Rep. Bobby Cleveland, who plans to introduce a one such bill next year, said many Christians feel they are under attack as a result of political correctness. He dismissed the notion of Satanists erecting a monument at the Capitol. "I think these Satanists are a different group," Cleveland, R-Slaughterville, said. "You put them under the nut category." Brady Henderson, legal director for ACLU Oklahoma, said if state officials allow one type of religious expression, they must allow alternative forms of expression, although he said a better solution might be to allow none at all on state property. "We would prefer to see Oklahoma's government officials work to faithfully serve our communities and improve the lives of Oklahomans instead of erecting granite monuments to show us all how righteous they are," Henderson said. 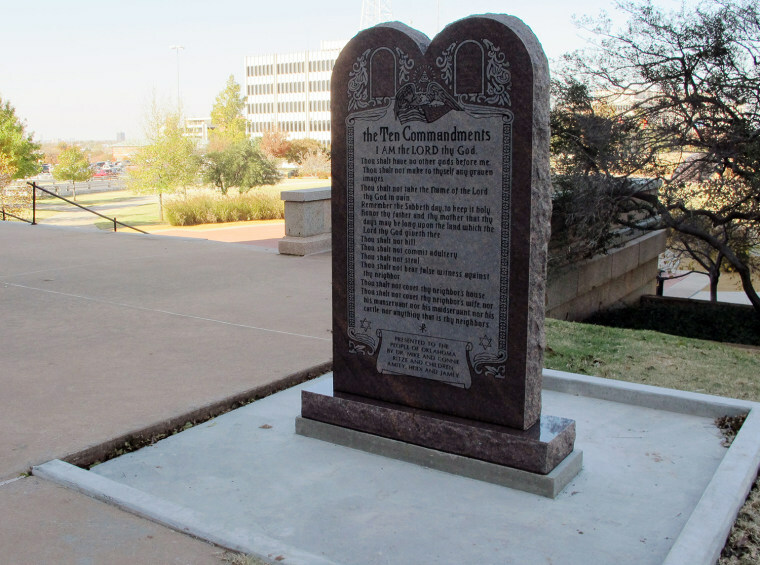 "But if the Ten Commandments, with its overtly Christian message, is allowed to stay at the Capitol, the Satanic Temple's proposed monument cannot be rejected because of its different religious viewpoint."